It Girls High Waist Slim Mom Jeans. I certainly don't enjoy the 24sd price tag, but other than that, I actually love the jeans. Yeah, not my colour, not my style, but seriously, just look at how gorgeous they look! 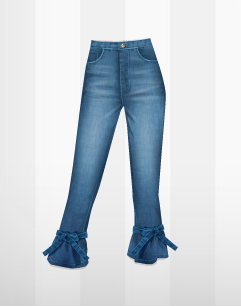 The graphics are a perfection, the jeans sit so well on my doll that I just can't take my eyes off. I'm definitely not too sure about the length itself, but even with that the jeans are awesome and I'd highly recommend those to any people out there who enjoy highwaisted jeans. Plus there are some cute bow details. But of course, that's just me and my own opinion. Hope you guys like the new HB release!